George Perle takes us into the composer's workshop as he reevaluates what we call "twentieth-century music"—a term used to refer to new or modern or contemporary music that represents a radical break from the tonal tradition, or "common practice," of the preceding three centuries. He proposes that this music, in the course of breaking with the tonal tradition, presents coherent and definable elements of a new tradition. In spite of the disparity in their styles, idioms, and compositional methods, he argues, what unites Scriabin, Stravinsky, Bartók, and the Viennese circle (Schoenberg, Berg, and Webern) is more important than what separates them. If we are to understand the connections among these mainstream composers, we also have to understand their connections with the past. Through an extraordinarily comprehensive analysis of a single piece by Varèse, Density 21.5 for unaccompanied flute, Perle shows how these composers refer not only to their contemporaries but also to Wagner, Debussy, and Beethoven. Perle isolates the years 1909-10 as the moment of revolutionary transformation in the foundational premises of our musical language. He asks: What are the implications of this revolution, not only for the composer, but also for the listener? What are the consequences for the theory and teaching of music today? In his highly original answers, Perle relates the role of intuition in the listening experience to its role in the compositional process. Perle asserts that the post-Schoenbergian serialists have preoccupied themselves with secondary and superficial aspects of Schoenberg's twelve-tone method that have led it to a dead end but he also exposes the speciousness of current alternatives such as chance music, minimalism, and the so-called return to tonality. He offers a new and more comprehensive definition of "twelve-tone music" and firmly rejects the notion that accessibility to the new music is reserved for a special class of elite listeners. 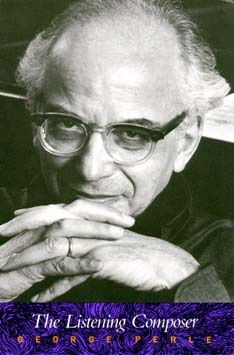 George Perle is one of this country's most respected composers and critics, winner of the Pulitzer Prize in music and a MacArthur Foundation Fellowship. His writings on twentieth-century music include the now-standard text Serial Composition and Atonality, Twelve-Tone Tonality, and The Operas of Alban Berg, all available from the University of California Press.